Presented here is the background of Epiphany and some traditional customs that can be implemented for the feast in your home. The Middle Ages, with its love for pageantry and the picturesque, celebrated the Feast of the Three Kings with much pomp and ceremony. 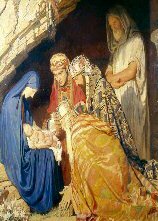 Their lives were dramatized, picturing them first as Magi, members of a learned and respected priesthood, then as counselors of a king, tutors of princes, skillful astrologers, and interpreters of dreams, and finally as kings with their offerings of gold, frankincense, and myrrh. What little was known about them offered fascinating material for dramatization: their call, their wanderings in the desert as they followed the star, their detention by Herod, their adoration of the Christ-Child, their return home to Babylon and Persia, and the subsequent conversion of their people to Christianity. Another custom peculiar to this feast and prevalent in Germany and other European countries is "star caroling." Three young men, colorfully dressed, accompanied by a star-bearer, go singing from house to house. In return for their "star songs" they receive some little recompense. In many localities these young men are altar boys who are thus rewarded in some slight way for their serving at Mass. Epiphany is a large celebration, especially in Spanish speaking countries. Things look different around the household: the infant Jesus in the manger now has a small gold crown and is wearing regal robes. The figures of the wise men have reached Bethlehem, completing the nativity scene. Reminiscent of Christ's baptism in the Jordan and the administration of Baptism on the vigil of the Epiphany is the blessing of water as it is still done in many churches. This "Water of the Three Kings" is then used in the blessing of homes on the following day. According to a central European custom pastors also may bless pieces of chalk for each family to use in inscribing the names of the three Magi over their doorways, as a manifestation of their Christian faith and a protection against the powers of evil. The initials are separated by crosses and the year above the door. The initials CMB also stand for the words "Christus Mansionem Benedicat" which means "May Christ bless this house". This inscription above the entry of our house should be a reminder to us that we should be with and go to Christ in all our comings and goings. A Twelfth Night Cake or Bread is usually baked, and the "Three Kings" are invited: either members of the family or other guests. If they are older, they can get involved in blessing the house by marking their "initial" over the doors. The children can prepare for the "Kings" by creating crowns and perhaps royal capes to wear.